Now first things first I want to clarify why I am writing these posts and how dealing with spinosaurid paleobiology is a veritable land mine. In my last post I echoed the sentiment of a poster for #2014SVP (Anduza, Danny Museum of the Rockies) that the wading "heron" analogy is not the best analogy of all possible tetrapod analogies for spinosaurids. As Dr. Thomas Holtz pointed out in the comments this is a "strawman argument" because no one has seriously suggested that spinosaurids hunted in the manner of herons which rely on a rapid acceleration of a sigmoidally orientated head and neck after visual detection of prey. And this is true: it is well known that spinosaurids had overall straighter and stiffer necks than let's say a fairly basal theropod like Coelophysis. Where the heron analogy works is that it provides a blueprint for an animal that wades in after prey. However, and this is a big however, spinosaurids - perhaps more than any other group of extinct animals save tyrannosaurids - lie squarely at the intersection of public and professional interest and interpretation. We saw this very interesting phenomena just occur - #Spinogate2014 - that illuminated an interesting socio-scientific-internet experiment. A radical new stance for Spinosaurus asserted, questions raised and doubt sown on the internet, and a very loud and vocal internet cadre of anti-Ibrahim et. al. proponents sallied forth. In fairness some of the Ibrahim et. al. critics are acting in good accordance with sound scientific scepticism and legitimate concerns. But one can not deny that a social aspect - bipedal loyalists, "bipedalists" if you will - are really hellbent on keeping the JP3 Spinosaur alive and well. And continue to do so even after Ibrahim et. al. discounted the criticisms. But this post is not about Spinosaurus or Spinogate it is about how an analogy for the group as a whole - the "giant heron" model - has been seized upon by the lay public as a point of reference for the group to the point where, I will argue, the "heron" model is providing a disservice. And the manner in which the "heron analogy' has gone too far is not wholly from paleontologists - but from how these animals are portrayed in artistic and especially video reconstructions. Unfortunately even though the "heron" analogy was useful in the broadest sense, popular reconstructions have run rampant with the "giant heron" model dominating. This is a hindrance. As you can see in these assorted and very beautifully rendered pictures of various spinosaurids there are echoes of the "giant heron" analogy in all of them. 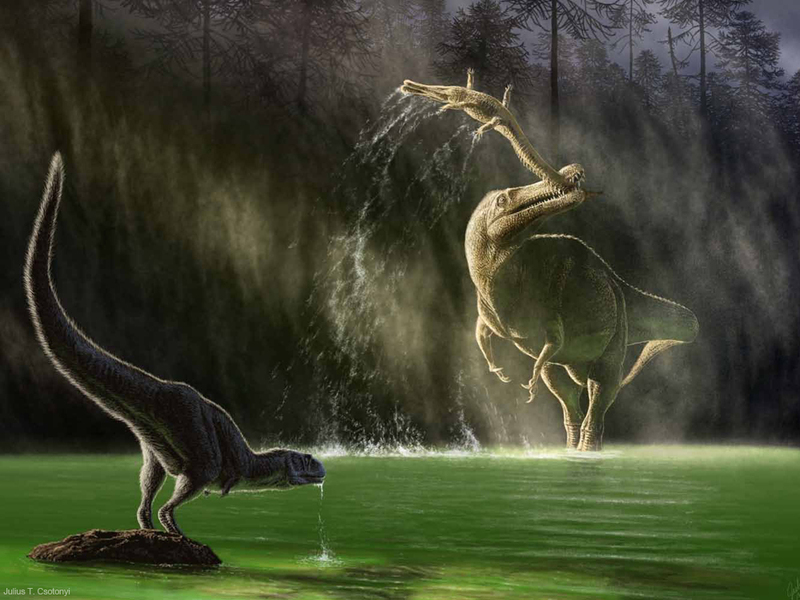 In none of the pictures do we see the spinosaurid body largely submerged. The BBC pic and the Witton pic (btw check out Witton's great deal on art, remember the holidays are coming and we should support independent paleo projects) suggest an emphasis on visual detection a la herons. But the lack of strong adaptation for binocular vision and emphasis on sensory pits speak against this. Unfortunately even the new NOVA doc on Spinosaurus depicts it fishing heron style. 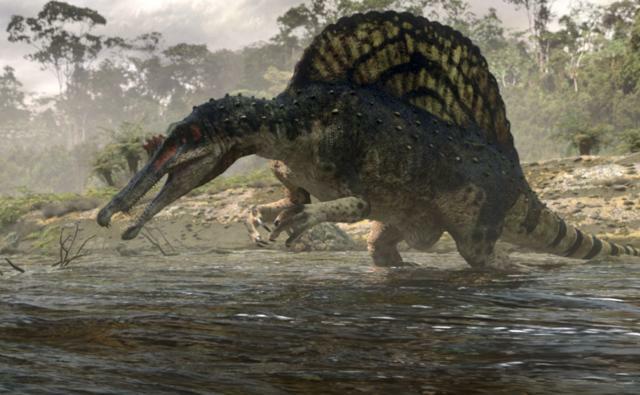 The Marshall pic shows the Spinosaurus taking advantage of its sensory pits but the choice of putting the animal on the bank of the water instead of in the water speak to a larger problem in spinosaurid reconstruction - A PERVASIVE FEAR OF GETTING WET. The Csotonyi illustration is awesome, but again conservative in term of water depth (book here). Seriously, for a group of animals that we can say exploited aquatic resources with strong confidence, there is a strong reluctance to actually put the whole animal in the water (where its sensory adaptations and foraging options make much more sense I will argue anyways). The above images have a profound impact on how these animals are imagined by laypeople and professionals alike. These representations that invoke the heron model to various degrees need to be dialed back a few degrees in my estimation. And here I want to provide some nuance to my argument. It is not that I am suggesting scenes like the above did not ever happen. That a spinosaurid, at one time during the long span of time such creatures existed, happened to be standing on a river bank and coincidentally a large fish just happened to swim by in shallow water and that the spinosaurid was able to lunge at it in a heron like manner and catch it - this most certainly happened. What I am suggesting is that the representation of such a moment and style of predation is disproportionate to the amount of time such a style of predation actually occurred. What do they say?... a picture is worth a thousand words. 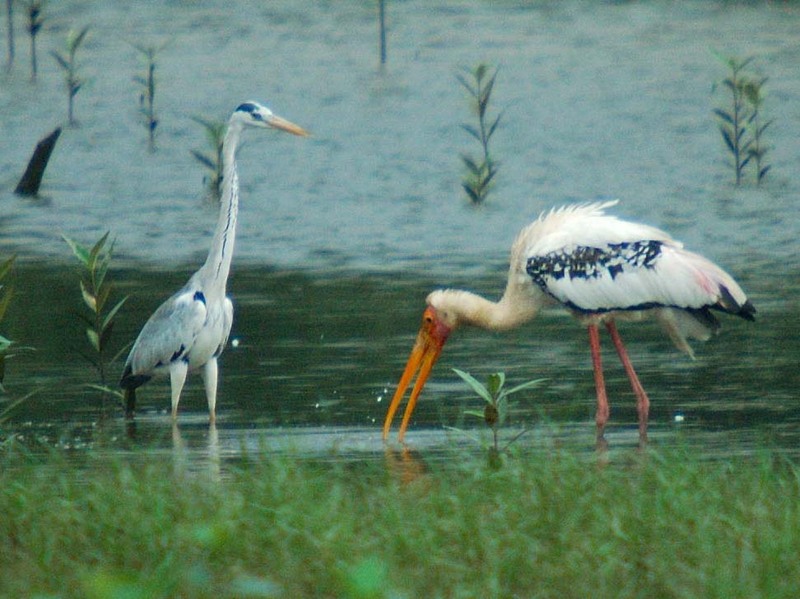 Above you see the very obvious difference in feeding between a wading grey heron and a painted stork. The heron relying on slow, cryptic stalking and the stork employing tactile feeding - sweeping its sensitive bill through the water and feeling out prey. Below is another video this time of a wood stork and various heron illuminating the different feeding strategies - also note that the wood stork will intentionally disturb the substrate to flush out prey. Hopefully you probably figured out where I am going with this. Various wading storks that employ a tactile method of foraging with their sensitive jaws immersed in the water offer more utility as an analogy to spinosaurid foraging behavior than visually dependent herons. A slight shift in perspective is all I am suggesting. In light of their downward sloping profile, sensory pit equipped snout, and lack of binocular vision this view of spinosaurids highlighting a foraging behavior dependent on tactile foraging is of some use and should be taken into consideration for popular reconstructions of these animals. You can see that Marshall almost got it right in the picture above where he at least got the snout in the water, but he did not want to get the spinos feet wet. Sheesh just put the whole animal in water and it makes much more sense. Which brings me to my next point, how deep of water to put these animals in. Anywhere on the spectrum of foraging in drying up pools all the way to completely submerged in my opinion. In light of the preponderance of illustrations/animations depicting them as seemingly limited to the shallows I am definitely for more depictions of them in deeper water. Even the new spino doc used this depiction of shallow water heron foraging. Furthermore, all things being equal, big fish are going to seek refuge in deeper water especially in predator rich environments. All these illustrations of spinosaurids in ankle deep water and a 200 pound lungfish or coelecanth just sort of nonchalantly offering itself up for grabs in the shallows.... yeah, I don't really buy it. Its insulting to fishdom and seemingly outside the bounds of Darwinian evolution. If fish are being predated upon fish will seek refuge in deeper water. And if you are a big spinosaurid trying to stalk a fish visually - if you can see it chances are it can see you and evade you. So how did a spinosaurid go about hunting in deeper waters? Well first and foremost for spinosaurids to be successful they want as many things in their advantage as possible. And that means murkiness. If you can't see me that means you might not swim away in time before my snout detects you. This might mean foraging at night, when fish although not "sleeping" do go into sort of rest phase and of course vision is limiting. Also many waters are naturally murky or turbid, especially in the tropics. Illustrations of normally murky tidal and tropical rivers intentionally clean things up a bit but that is simply an artifact of allowing the viewer to see what is under the water. Tides and storms can also disturb the water creating turbidity. 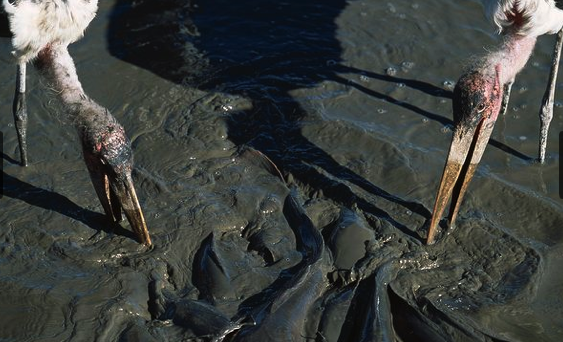 Other animals, dinosaurs frolicking, and the large fish themselves rooting around in the mud will create turbid conditions. Remember the "river of giants" and also that lungfish are known feeders of benthic prey and are rooting around all the time. 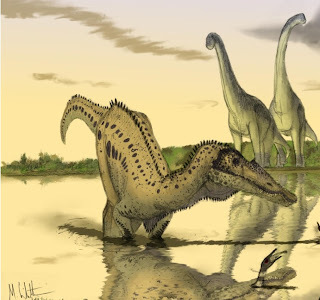 And then finally the spinosaurid itself; if conditions are just a little too clear; if prey is hiding in vegetation or in the mud; just use your big feet to stir things up a bit. Like a 10, 000 pound wood stork. After that it is just a matter of slowly cruising the water until your sensitive snout and/or gaff clawed hands bump into something tasty. 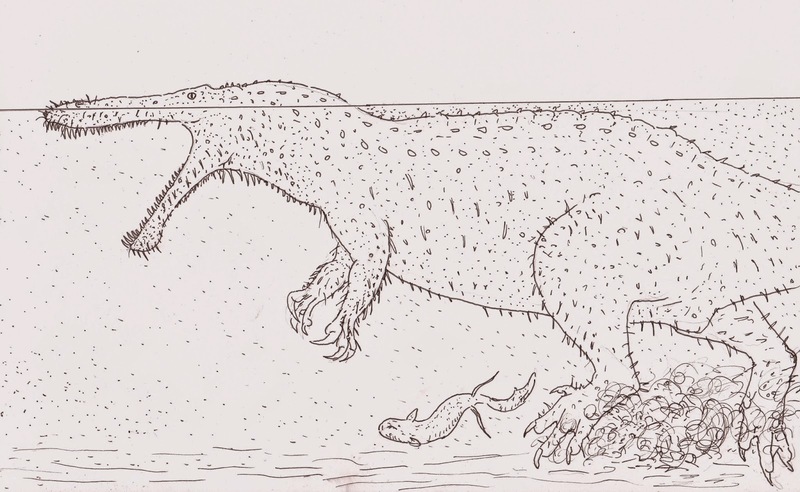 Which is pretty much what I am trying to illustrate above where a Suchomimus tenerensis is intentionally stirring up the sediment in order to flush prey ( a poor lungfish of course) and cloak itself as well. Notice I draped loads of barbs or "whisker" type integument over the animal in order to make the whole animal sensitive all over. Hey why not, we are in a bit of an integument free for all for better or worse. 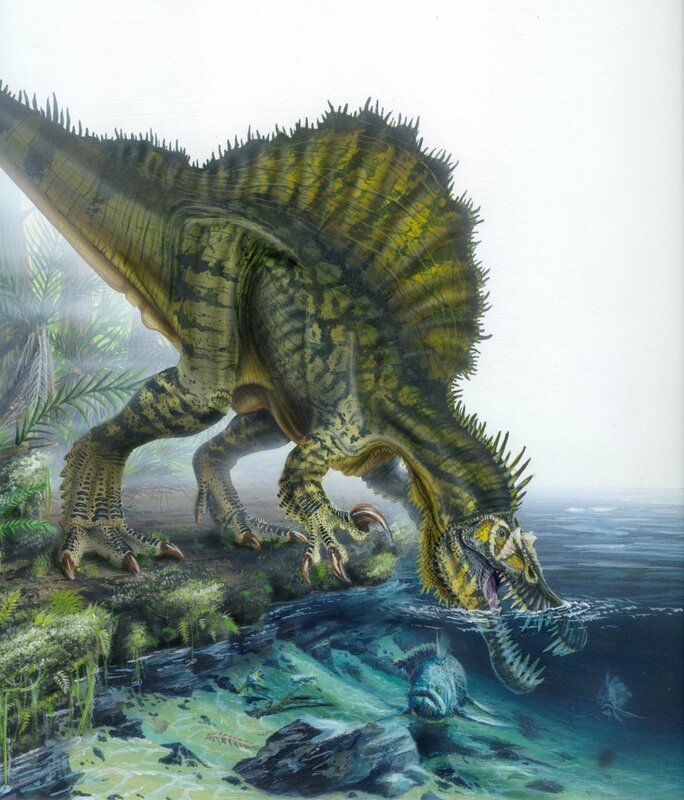 But I should also add that when fish were concentrated in drying, shallow pools or pushed through topographic bottlenecks due to tides, migrations, spawings any self respecting spinosaurid in the area is going to hone in on that area to forage as opposed to the method depicted above. But such confluences of events that make fish so easily scooped up are usually few and far between. I should also note that there are some artists that have begun depicting spinosaurids mostly or even completely submerged. Brian Engh's depiction comes to mind (in fairness this Spinosaurus was made before the new reconstruction). He also has got the arms and claws outstretched feeling for possible prey and increasing its feeding envelope. His depiction is suggestive of an animal dependent on tactile senses. Check out his awesome blog Don't Mess With Dinosaurs and remember it for the holidays because he has some pretty cool merch and we all need to support independent paleo/monster creations if we want more of 'em!! *Update 11/8/14 Andrea Cau of Theropoda has also been beating the drum for putting more of spinosaurid anatomy immersed in the water. Anatomically citing a body design pitching forward and down - an anteroventrally inclined head partially immersed in the water has depicted in the below schematic. In the comments below Andrea informed me that Simone Maganuco brought up the "stork analogy" 5 years ago in a conversation - so credit where credit is due. Why the "heron" model has dominated the view of these animals over others such as "storks" is a question worth asking. Maybe many view herons and storks as sort of "samey" while in fact their foraging method is quite dissimilar. It is worth speculating that dinosaur thought and concept is still largely dominated by North American and European peoples. Where, especially in America, there are a lot more visual orientated heron type aquatic waders than tactile stork type aquatic waders. I believe we pretty much just have the wood stork. Europe is known for storks but primarily they have white storks which often feed in wet meadows and fields as opposed to in the water. But go down to an east African river or spend a week on the Pantanal and you will see relatively more of all types of waders - but especially stork style tactile waders. So in conclusion more "stork" and less "heron". But actually I like "storkodile" the best because it gives reference to the tooth studded jaws, large size, and opportunistic nature of these beasties. Eat your heart out Crocosaurus. In various posts in my blog - well before the new information by Ibrahim et al. paper - I have suggested that the most plausible explanation of snout and vertebrae unusual features in spinosaurids are adaptations for a permanently flexed posture with half of body submerged, snout projected anteroventrally, foraging underwater (http://img.webme.com/pic/s/spinosauridae/spinosaurus_fishing.jpg). In a discussion with Simone Maganuco, he first used the "stork analogy" about five years ago. Very nice to see convergence on thought and I do read your blog constantly so your thought informs a lot of what i write either directly or subconsciously. And I remember the picture you mention. I am not trying to lay claim to the "stork analogy" just sway the discussion in that direction. Because, in my estimation, the "heron" model still dominates in most minds. For example in the NOVA documentary they still use "heron" style hunting and even in the Nat Geo article on the new spino Ibrahim still relates it to acting like a heron. It should be noted that this thing physically had no way of being quadrupedal, even if it did have short legs. The knuckles don't come into proper contact, the shoulders cannot move in the right way and the scapula would rip its head off. I imagine a pelican-like waddle as being much more likely. @Bk Jeong Maybe you are referring to a different post where I actually talk about locomotion? Per the bipedal/quadrupedal argument I have invoked belly sliding - which is not really quadrupedalism, but net really bipedalism either - as an elegant solution for S. aegyptiacus. Not elegant in how it looked, but belly sliding solves the COG problem, is used by large crocodiles in similar habits today, is used by several extant theropods (penguins, loons), and is merely a co-option of known resting theropod anatomy and therefore require the least amount of evolutionary steps among all scenarios postulated so far. Unlike many I don't see a lot of hope in retrieving fully obligate, pelican/pangolin like or otherwise, for S. aegyptiacus. I can imagine that immature members of the species may have had much more flexibility in choice of locomotory gait. Belly sliding would be an option in shallow waters, etc, but on hard ground it doesn't work too well.